Available to haul stone, topsoil, asphalt, etc. day, night, and weekends. 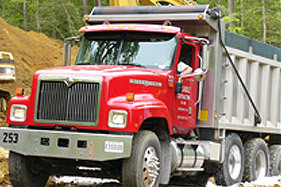 Dump trucks are an integral part of Reliable Contracting Company Inc.s’ business, in fact it is what we are most recognized for – the company with the big red trucks. 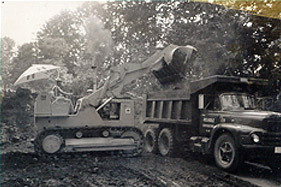 The Baldwin brothers, Frank and Bill, started the trucking side of our business in the 1930′s with the purchase of one dump truck that they hired out for hauling dirt and rock. Now the company has a fleet of 100 dump trucks equipped with the latest GPS technology and the best team of drivers in the business to support all of the services that Reliable now offers. Reliable Contracting takes the job of hiring drivers for our fleet very seriously, and therefore, we have the safest drivers in the industry and some of the most experienced. Our drivers also take great pride in maintaining their vehicles. Reliable is noted for the excellent condition of our trucks versus other companies in the same industry. Dependability is another strength of our drivers. We never have a problem providing your job with enough trucks to get the job done. We are available to haul stone, topsoil, asphalt, etc. day, night, or weekends. Safe, dependable, experienced and conscientious… there is no doubt in the minds of those at Reliable, that we have the best fleet of drivers in the business.